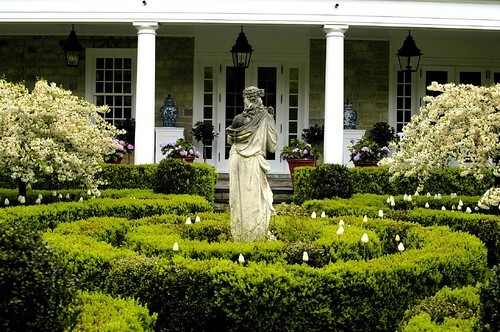 The weekend that this Garden Lady chose to visit Connecticut was based on the weekend when an event called Trade Secrets was being held. Trade Secrets, a two day weekend event was created as a charity to benefit the local Women’s Support Services that is trying to eliminate domestic violence and abuse of women in their area. I was told they help women both in Connecticut and New York. According to Amnesty International, 1 in 3 women across the world is abused. WSS literature said that in 2001 Trade Secrets “was developed as an annual garden antique and rare plant sale with the help of community member Bunny Williams and her head gardener and former WSS Board member, Naomi Blumenthal.” Since TheGardenLady had only heard rave reviews of Trade Secrets that was designed for garden lovers and knew how beautiful that part of Connecticut is, she asked a friend to join her. Off we went not knowing what to expect. Well, now I have to add my rave review. Trade Secrets exceeded my expectations! My friend and I cannot wait until next year to return. The event has a fee to enter which is not cheap. But knowing that the money goes to a truly worthwhile charity makes it easy to support. The location of the sale is on a beautiful garden/farm called LionRock Farm where even if you don’t buy one thing, you can enjoy the farm and everything you see. For the entrance donation they provide a really good breakfast with fresh fruit and the best Danish pastries I have had in a long time. They have a restaurant that will sell lunch if you want, all served in a stunningly decorated barn/guest house. At the antique and rare plant sale set up in the garden were 40 outstanding vendors. I believe that they were mainly from the East Coast but I believe they will ship things. The quality of the unique and unusual plants and antiques were impressive. The GardenLady will be writing later posts about a few that I thought were particularly interesting- for example, an epimedium specialist. In the pool house they had about 10 garden writers who were signing their books. You could meet the authors and buy their books. All the work was done by volunteers who were the most delightful, helpful, knowledgeable and friendly people. A percentage of the sales went to WSS. So it made buying all the more agreeable. After visiting Bunny Williams’ garden, we visited four other magnificent gardens. I was told that each year, only Bunny Williams garden is shown again; all the other gardens are new to the visitors. Believe me when I tell you that TheGardenLady had gone to garden heaven when she went from one heavenly garden to the next. In 2012 Trade Secrets will be held on May 19th and 20th. TheGardenLady will write a post to remind you next year. Make reservations early because rooms fill up early. Come with camera supplies because it is difficult to find stores that sell these things. I tried when I ran out of space on my camera card.